Operated by Cruise Whitsundays, the Camira Sailing Adventure is a fully inclusive all day tour to one of the most beautiful beaches in the world - Whitehaven Beach. This is the beach of dreams. Its powdery white silica sand is what makes this place unique and add to that the fact that the only way here is by boat or air; you'll see why it's just so special. 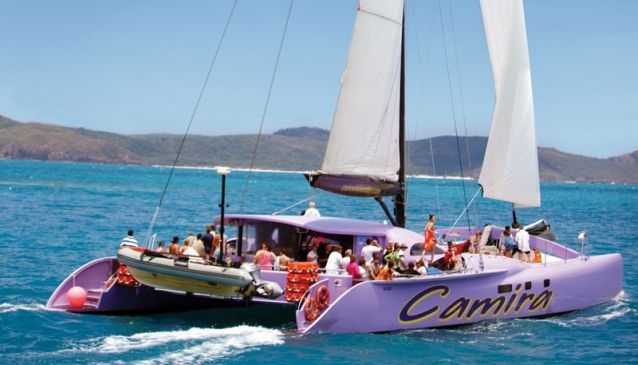 Camira is a big purple catamaran, so you can't miss her. She is sleek, spacious and fast. In fact, she's one of the world's fastest commercial sailing catamarans, but just because she's fast doesn't mean to say she's unkind to the environment. Cruise Whitsundays has an Advanced Eco Certificate for her, which means they achieve and use best practices when it comes to using resources wisely, contributing to the conservation of the environment and helping local communities. Your day starts at Able Point Marina at Airlie Beach where you board the catamaran and sail through the islands to the most beautiful of them all, Whitsunday Island. This is where you can swim, snorkel or enjoy the fabulous beach, but don't be too long because lunch is not to be missed. A fantastic barbeque lunch is served up, a banquet of tropical food and salads. Not only that, but morning and afternoon snacks and drinks are also included, as well as beer and wine from 11am. At the end of a wonderful day return to Camira and sail away past the islands back to Airlie Beach. The trip is all-inclusive which means all your food and drink is included, you don't have to worry about a thing. Snorkelling gear and wetsuits are all on board; transfers from local accommodation to the marina and a fee to help protect and manage the reef by the Great Barrier Reef Marine Authority are all covered. All you need to remember is your swimwear and a towel, protective clothing, hat, sunscreen and your camera.